Do you have an interest in workplace inclusion? This might be just the TED Talk for you. Janet Stovall, a cultural conversationalist, speaks on her personal experiences with race and diversity during her college years and her fight for inclusion and education in subsequent years. When discussing the fight for equality among the LGBTQ community, the role of the ally is often times forgotten. An ally can provide support, comfort, and advocacy while teaching others acceptance. The LGBTQ fight is so much stronger with allies and Kerri Washington epitomizes that. Kerri spoke and pushed for more representation in media, film and production. 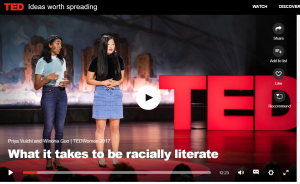 What is racial literacy and how can we become racially literate? Two recent high school graduates present us with the insights they have acquired while traveling the country blending personal stories with statistics and studies.